Have you seen Leo's handsome face on the new HollyRod.org iPads for Communication site? So proud of HollyRod's success in raising money to get iPads to kids who need them, and grateful to the apps developers who donated copies of their software. It's an ongoing campaign, so please donate if you can! Educators: Check out 42 Interesting Ways (and tips) to use an iPad in the Classroom by Josh Fassbind (via Liz Ditz). Last week I participated in a fun TweetChat hosted (but not sponsored, Ashley) by Ruckus Media: A Chat About Apps and Autism. 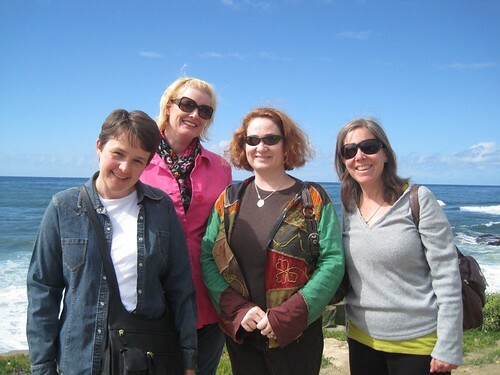 I am spending a iPad-free (mostly) weekend in La Jolla, at a writing retreat with three women most splendid. We have had breakthroughs, workshopping, wine, and walks. Leo spend the weekend at camp, Iz spent part of her weekend at the SF Chronicle Spelling Bee semi-finals, Mali spent her weekend hanging with her daddy drawing pictures of Angler fish. Fun weekend for all. And I am apparently all out of words. Hope your weekend was loverly. Our weekend was spent half in the hosp for another rage attack/meltdown and the other half was trialling new meds (which might be working but shhh, don't spread it around, ok? ).